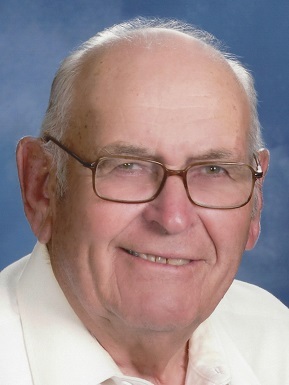 PORTAGE – Harold A. Johnson, age 88, passed away unexpectedly, on Monday, January 14, 2019. Harold was born on September 26, 1930, the son of Alfred and Meta (Messer) Johnson. He was confirmed in 1944 at St. Paul’s Lutheran Church in Caledonia, and graduated from Portage High School in 1948. Harold married Shirley Peterson on October 24, 1959 in Wisconsin Dells. He served his country in the United States Army from 1951to 1953 including time served in Korea, and helping to build the Freedom Gate Bridge. He was also a member of the Army Reserve from 1953 to 1957. Harold was awarded the Korean and United Nations Service Medals. He worked for the US Post Office in Portage for 26 years until he retired in 1990, and then worked for Adesa Auto Auction from 1995 to 2014. Harold enjoyed hunting and fishing with family and provided countless meals of fresh fish filets to friends and neighbors. He was a long-time member of St. John’s Evangelical Lutheran Church in Portage. Harold started playing Sheepshead at the age of 4, sitting on his mother’s lap. He continued playing cards daily with friends downtown and enjoyed his “night job” playing at the Blackjack table. He was a loving and devoted husband, father, grandfather and friend to many. He taught his family, by example, his strong faith in God and how to live with integrity and honesty. Harold earned the respect of everyone who knew him. He is survived by his three daughters, Lori Udelhofen, of Baraboo, his former son-in-law, Larry Udelhofen, Shelley (Rodney) Oosterhof, of DeForest and Nancy Johnson, of Portage; seven grandchildren, Cassie Krueger, Jared Udelhofen, Jessica (A.J.) Fischer, Brett (Rachael) Udelhofen, Haley, Brandon (Abby Aide) and Carly Oosterhof; 14 great-grandchildren, Dylan, Hannah, McKenzie, Haley, Justin, Kayla, Rylee, Olivia, Makayla, Traeton, Zoe, Luca, Landyn and Wyatt; 1 great-great grandchild, Nevaeh; his brother, Alvin (Marilyn Pahl) Johnson, several nieces, nephews, cousins and many friends. Harold was preceded in death by his parents, his mother-in-law and father-in-law, his wife Shirley, an infant brother, his sister, Lois Spear, and his close friend Mary Jane Huber. Funeral services will be held at 11:30 a.m. on Saturday, January 19, 2019 at St. John’s Evangelical Lutheran Church in Portage, 850 Armstrong St., Portage WI 53901, with Rev. Rod Armon officiating. Burial will follow in Newport Cemetery, with Military Honors provide by Portage Area Veterans Honor Guard. Visitation will be held on Friday, January 18, 2019 from 4:00 p.m. until 8:00 p.m. at the Pflanz Mantey Mendrala Funeral Home in Portage (www.pmmfh.com), and on Saturday from 10:30 a.m. until 11:30 a.m. at the church. In lieu of flowers memorials may be made to St. John’s Evangelical Lutheran Church in Portage.